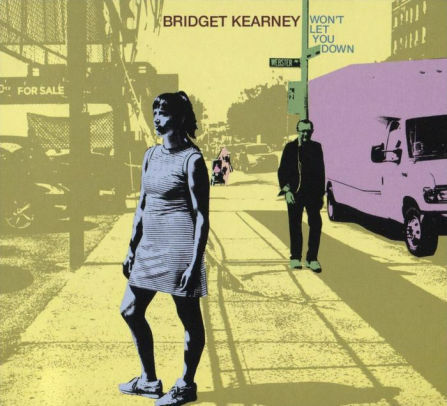 Won’t Let You Down may be Bridget Kearney’s debut album, but she’s no newbie; she’s the brilliant bassist and frequent songwriter for Boston-bred soul-pop group Lake Street Dive. For her solo debut, she’s left behind the easily accessible, G-rated funk her band does best for a brainy, infectious and mature sound. “Don’t listen to that racket / C’mon and let me put my pin on your jacket” she sings on the title track, handily feminizing the power-pop love song narrative, and inviting us into her club. The album’s intricate, but never overdone production ties together Kearney’s wide palette of songwriting skills. “Serenity” is a good bit of new wave-y pop that’s a gorgeous showcase for Kearney’s legit jazz training. “Living in a Cave” is beautifully Beatles-ish, while “Love Doctor” is cheeky, grimy and funky, a post-breakup shower belt-out for the ages. Kearney’s been singing backup to Lake Street Dive’s powerhouse vocalist Rachael Price for years, so it’s lovely that this includes a new version of one of Kearney’s songs from Lake Street Dive’s last album. Kearney’s performance of “So Long” may be less technically perfect than Price’s (who has one of those voices that is simply an instrument from God), but her soulful, breathy rendition shows just how much a singer can do with phrasing and emotion.